Why the change of title? 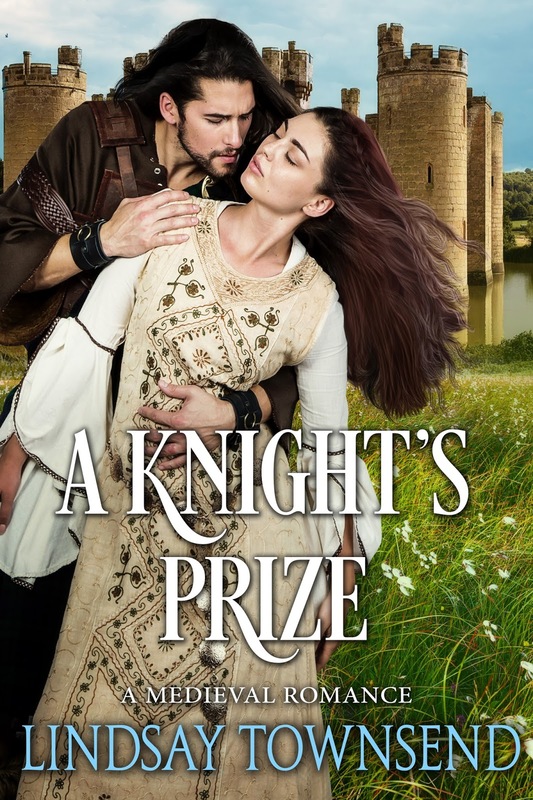 Because this historical romance is set in the world of jousts and tournaments, where knights fought for prizes. "He has walled us in alive! Our own lord has abandoned us!" But he has done so, Edith thought, as she crouched to give her shivering cow a drink from a bucket of water. Sir Giles de Rothency, their brutal lord of Warren Hemlet, had driven all of them, villagers and beasts alike, into the church and had ordered his men to seal them within to die. He might have spared her, for she was the smith's widow, skilled in metal-working and so useful, but she had entered the simple, windowless church willingly enough. It could be that they would all die of the pestilence soon, and she wanted to be with her own people. "We have wine and water," she reminded the others, rising to her feet and speaking above the hammering as their lord's men barred and sealed the door. "We are in a holy place." She hoped her voice would not waver as she said this—she had fallen out with God. "We are together." "What use is that when our lord herds us in here, the hale and the sickening, so all perish?" Edith trod on the loud-mouth's foot. "We are together," she repeated. "Those men outside will not stay for long. If we go quiet and stay quiet, they will think us dead. We know this has happened before, in other places." Around her the villagers grew silent, thinking perhaps, as she was, of the ghastly rumours concerning the pestilence. Only last month a peddler had come to Warren Hemlet with gruesome stories of people going to bed healthy and dying in the night; of people dying in the fields, in the washing houses, in the streets. No one was safe, or spared. She had seen it herself, all this last week, in her own village. So many had died. From their village of four-score souls, only three and twenty were left. Of these, Anwyl was already coughing in one corner and Peter the shepherd lay shuddering and whimpering amidst his scrawny sheep, his neck covered with red boils. And then their lord had come—not to save them, but to ensure the sickness did not spread to him. Which was how they came to be here, in the church: a stone building Sir Giles intended would be their tomb. "But we shall escape," she said aloud. If she was to die, she wanted to do so out of doors, under the blue sky and trees. "We shall break out." "And flee this place, that God and his saints have left," said her brother quietly. Gregory could always speak and be heard: he was the priest here, so people listened. "How do we do that when we are locked in?" demanded the loud-mouth. Edith threaded her way round the villagers to the stone font and picked up the baby she had carried into the church with her and laid in the dry stone bath. She unwrapped the "baby's" saddling bands to reveal her own metal-working tools, bundled together in a rough blanket. "We shall get out," she said. "And then?" demanded the loud-mouth. He was as noisy as a miller, Edith thought, but she did not say that. Their miller had been one of the first to die at Warren Hemlet and since then there had been too much death, and talk of death. She glanced at her brother, but Gregory was tending a shuddering old man, Martin, who lay against the south wall of the church, giving him his own cloak. Soon, Edith guessed, he would be leading his depleted flock in prayer, but her thoughts ran to more practical measures. "First we must be quiet. Those outside will not leave until we are." To mark her point she crossed back across the nave to her cow and settled down beside Daisy, taking a small comfort from the warmth of the animal. When she said nothing more, the other villagers began to lament afresh, then they too fell silent. Edith closed her eyes, pretending to sleep. She had plans. If they lived, she had many plans that would bring them food, riches, honour and a different life to slavery in their lord's fields. Gregory disapproved, but so he must for he was their priest, and he had sworn to keep his distaste to himself. He had grudgingly admitted they had few choices, and none virtuous. Edith considered her scheme afresh. Again she was glad her grandfather had once been a sailor, and that her old husband, Adam, had been so excellent a smith. From these two worthy men she had a fund of stories she could draw on and more besides: bundles of cloth, paintings on the tops of tables, strange devices, knowledge of steel and surgery, fine pottery. The things were buried in her herb garden, the memories in her head. She would need both. "Ranulf, what are you doing, talking to that wheezing old crust? The games of love are soon about to begin!" Ranulf had his back to the speaker but he recognized the ringing voice. "Such trifles can wait, Giles," he replied, without turning round in the narrow tent, "I wear no token save my late wife's, you know that. I must speak with my steward now." Seeking the next name, he bent his head lower to the parchment spread out on the small table. "But the ladies will be there at the castle!" "Not my lady." Ranulf pointed to the next name on the list. "How fares Alfstand village?" he asked his steward Offa, who had once been Olwen's man. "Have they men enough for the hay harvest or do you need coin to hire more?" Offa, a steady, sturdy man, had sense enough to ignore Giles's huffing behind them and answered promptly, "More men will be needed, sir. The hamlet is most piteously afflicted by the general pestilence. I would say we need seven or eight." "Make the ones who are left work double," said Giles, sounding to Ranulf as if he was stifling a yawn. "Leave that, Ran, and come out into the sun, or you will soon be as sallow and puny as a clerk. No way to win a new lady!" Ranulf thought of Olwen, of her pale beauty and secret smiles, and he longed to knock Giles's smugly handsome face against the tent post. Why had God granted him and Olwen so little time together? Why had their time been so marred? He was a widower at six and twenty, with no wife or sons and a host of bad memories. Was he a fool for still loving Olwen? For still missing her? "Ranulf, you cannot hide away in that black armour of yours forever." "Hell and damnation, Ran, you are as dull as a priest these days! When was the last time you went wenching?" But Giles was already leaving, with a final jab—"The Lady of Lilies will be there; not that the princess will favour you and your miserable hide"—and Ranulf's heart and head burned afresh. He stared blindly at the list of names, wishing he could go back to bed. Every day was the same, a dragging of his useless limbs around whatever joust or tourney he and Giles were at. If the pestilence overwhelmed them all in the end it would be a relief to him. But not, perhaps, to his people in the north: they depended on him. He sighed and looked at the list again. "She is said to be very mysterious. It is said she can predict who will win at jousts." Ranulf grunted and tried to find the next name. "To be very beautiful, also." "Who is, Offa? The queen of elf-land?" "The Lady of the Lilies. I have never seen her, but I can believe it." Ranulf found himself wondering about the damsel's true name. In the last few months she and her company had appeared at almost every tourney. He had been away on his estates, but now he had returned to the jousts, her name seemed to be on every man’s lips. Some said she was the mistress of Sir Tancred of Mirefield, a knight he knew to be of middling ability, but a good-natured sort. "I have not seen her, either," he admitted. He had not sought her out before. Now he wondered why. Was Giles right? Was he turning into a clerk? Was he dull? Giles has not seen her, either, he reminded himself, but then Giles had also been away, at the courts of France, and had only lately returned to England. "Her tent is a wonder of colour and delight, Sir. I saw it this morning, on my way to you. Her attendants were erecting it and making all fine." That surprised him. "She does not stay at the castle? I thought all the ladies were with Blanche Fitneyclare." "Not my Lady of the Lilies. The castle is too old and dark for one so delicate and fair." Ranulf raised his head and stared at his steward. "You, too? I thought it was only Giles who fell in love so quickly, and sight unseen." The older man scratched at his ear and cleared his throat. "The list of harvesters will keep until noon-time, sir. The Lady of the Lilies demands that knights who would claim her favour seek her out first, ahead of the other ladies. And she will make us wait. It is said she always makes squires and knights wait." "Arrogant wench!" In spite of this, Ranulf felt a glimmer of interest, the more so when Offa set his sturdy legs more firmly apart and said ruggedly, "She is a real princess, sir, from the far east beyond China and Cathay. She travelled west from her father's court to escape the pestilence." "Her father let her come all this way? I did not think her retinue so large." "No one would dare interfere with my Lady of the Lilies." Ranulf sensed that Offa had an anecdote he wanted to share, and he tried to block the matter with a terse, "A pity for her, then, that after all that travel, the pestilence has come here to England." Offa's swarthy face darkened to a dull red. "I would like to see a real princess." The words before I die hovered in the air between them. Ranulf gave up and straightened, cracking his head on one of the tent poles. Refusing to rub his smarting forehead, he ducked toward the door-flap, saying over his shoulder, "For you then, we shall both go, or I shall have no peace before I fight." He could not see Offa's face but he sensed the man grinning as he stepped out into the sunlight. Promise me, her brother had pleaded with her on his death-bed. Promise me you will guide them to a better life. That you will not live a wicked life of sin and lies. They follow you as they follow me, so you must vow this, Edith. And, clasping his limp and fevered hand, she had vowed that she would do all he had asked, for Gregory had been dying and she had wanted to comfort him. Three days after she had broken them out of Warren Hemlet's church, her brother had collapsed. She had tended him, building up a bed of grass and heather by the road-side, warning the surviving villagers to stay back. Fearing the pestilence, these had fled into the woods, but they had returned after she had buried Gregory at the edge of one of the strip fields. Walter had even carved a cross for her to put on the grave. She had made the sign of the cross but she had not prayed—why should she pray to a God who took Gregory but allowed Sir Giles to flourish? After a time, prompted by the children's hunger-cries, she had moved from the grave and tottered on, blind as to where they were going. She had expected to die, but she had not. When she did not die, she took it as a sign that God had not noticed, and she had decided that God would not notice when she put her first plan into action. For two years now her plan at worked well and better than well, even more sweetly than she had hoped, and she told herself that she felt no shame—none, excerpt for when she dreamed of Gregory. For the last month, she had been dreaming of her brother every night. The truth of it was that she did not like to sleep without a husband. Bundled with the other widows at night, she missed a man's warmth, a mate's rough yet tender wooing. At such times, all she could do was work: labour until she was so weary that she dropped like a stone onto her pallet. I have some time before the knights arrive and clamour for favours. I could take our bed linen to the river to wash. With my work-rough hands and my hair over my face no tourney man will know me. Yet if any lusty serving man detains me and he is charming and comely, then why not? If we are all due to die soon of the pestilence, why not indeed? She smiled and began to strip the pallets. She was walking with the bundled sheets to the shallow, slow-moving stream when she realized that another was there before her. A man, big and muscled enough for a knight but not in armour, was sitting on the river-bank with his boots off, dangling his bare feet in the clear water. Large, fine feet they were, too, and very clean. She stood in the shade of a young beech tree, shielded by its fresh leaves, and watched him; this nameless knight. He was new to her, and a pleasure to look upon, with a trim waist and good shoulders. He slowly kicked his legs in the water and she noticed the dark swirls of down on his calves, less lustrous and straighter than his fair-going-to-russet shaggy, badly-clipped hair. She wondered if the tiny dark fish were nibbling his ankles and laughed softly at the foolish idea. He was handsome, she conceded, if long, clean-shaven features as regular as a mason's new carving of a king were to one's taste—and they were to hers. On his feet, standing proudly on the daisy and speedwell studded grass, he would be tall as a castle keep, but wiry, with a rangy strength she admired when he skimmed a pebble across the river. Such vivid thoughts brought a wave of heat pounding into her face, but she kept staring, tense as a harp string, waiting for something, some sign as to whether she should be bold. It would be a foolish risk, but then, would he know her again? "Probably not, for he is but a man,” she murmured. And it was a glorious gold and blue morning. A kingfisher flashed by, bright as a rainbow, and her knight looked both comely and charming. Choosing for herself, she lowered the bundle of bedding and took a step closer. Ahead, her nameless knight splashed in the stream like a young lad and she chuckled to see him so simply happy, but then, perhaps hearing her unguarded laugh, he turned his head. His lean, narrow face was bleak, with a haunted look of grief about his dark brown eyes: a strained, weary face of many lost and lonely days. Sorry to see such pain and now shy of intruding, she moved sharply back, into deeper cover and shadow, but he called out to her. "Little maid?” The unguarded, stricken look dropped from his face as he smiled—to reassure her, she realized. “The bank is large enough for two. I shall not trouble you." When she did not stir, he patted the ground beside him. "The sun is warm and the water very pleasant. We may sit together in peace." He smiled again, his teeth white against his tanned face—good, strong teeth, she noticed, and none missing—"You have my word." Tempted, she almost moved forward, but then caught herself in time: he was being kind, but such grief as his should be respected. To make all sure, to stop herself from yielding, she called back, "I must go. My lady awaits." "Your lady? No lord, then?" She did not answer his questions. It was time to go, more than time. A tumble in field might be a consolation, as a plucked flower may be a delight, but both would quickly fade. And if we are all to die of the pestilence, what matter? Did you not hope and plan for exactly this kind of encounter? Stop this foolish shyness! Seize this brawny, beautiful brute and make him yours for the morning! She shook her head against herself, her loins and lips tingling at the lascivious notion. That glimpse of his heart, and his kindness, made him real to her: a person, not a day-dream of desire, and she would not treat him so. Thus, when he rolled to his feet in a swift, powerful arc of movement, she skittered sideways, away from his likely approach. Plucking the heap of sheets off the beech mast, she gathered them tight and then pelted off, the sun burning on her head and face. Torn between going and staying, even as she fled, she made for the tall, multi-coloured tent at the eastern side of the tourney ground, her mind in as much turmoil as a kicked beehive. We could have this morning, and then? Do not look back! Do you want to lie with him and then yearn after him for weeks? Do you want him to regret our union? Do not look back! He may take it as a signal to follow! Do you want to watch him flirt with others, and realize that grief of his, that seeming care, is as shallow as a dew pond? Worse, do you want to see him with another lady and know for sure our time meant nothing? "I would be his equal and mean all of it," she panted, her calves and thighs aching as she ran past a startled group of pages, who instantly began to point and to make lewd remarks on her bouncing breasts. "I am his equal." Against the jeering of the tousle-headed, gawping lads, her voice sounded false in her ears, too light. Ranulf knelt beneath the spreading branches of the beech tree where the maid had sheltered. Offa was still in the bushes somewhere, struggling with his bowels. His poor steward had been sweating with fear, though he had tried to convince the hapless Offa that it was likely nothing more than the sudden, unfortunate results of eating a bad meat pie, and not the pestilence. He rose off his knees into a crouch. She had been about this height, as brown and nimble as a sparrow, with a mass and maze of hair. She had carefully hidden her face and eyes. Perhaps her mistress had not known she had ventured to the stream; perhaps she was playing truant, like a school-boy. A mystery maid, much as the Lady of Lilies was a mystery princess. "I wonder who she belongs to?" he said, idly patting the narrow trunk of the beech where the lass had leaned and not really caring at that moment if he meant maid or princess. "Offa!" he bawled, pitching his shout above the stirring camp, "Have you died in that hedge?" There was a cracking of twigs and his steward burst out into the water-meadow from a stand of hawthorn and guelder rose, his mouth already busy with excuses. "Peace, Master Steward, and lead on." Ranulf waved off the rest, only half-listening as Offa apologized again. All of this—stream, maid and princess—were pretty diversions. They would pass the morning until it was time to fight again.